Date Night hears a lot of opinions about who has the best burger in Atlanta. We really like the burger at Boccado, but we have yet to have the world-famous Holeman and Finch burger in Buckhead. Our friend and regular reader Mags McDee told us to go try Moxie Burger as she thinks it is one of Atlanta’s best. 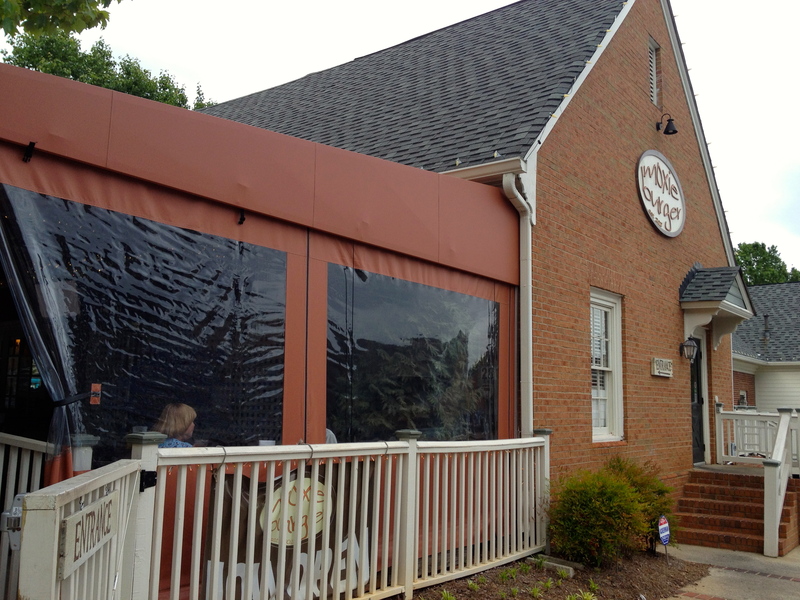 Since it’s just a few miles from Date Night headquarters in Marietta, we drive over to see what Mags is talking about. Not much on the outside, but good burgers inside. Moxie is inside of the Paper Mill Village shopping center, towards the back. You stand in line to order and they bring you your food, which is how they do it at Yeah Burger, another Date Night favorite. The place was crowded the entire time we were there. As you would expect from an East Cobb location, there are a lot of families here and a lot of kids, all of which are surprisingly well-behaved tonight. We get to Moxie just in time as there is no line when we arrive. A line forms right as we find a table and people keep coming for our whole meal. We start off with two amazing beers. These are Allagash Tripels in 16-ounce cups. Usually, 9% beers come in much smaller cups, but don’t tell Moxie. 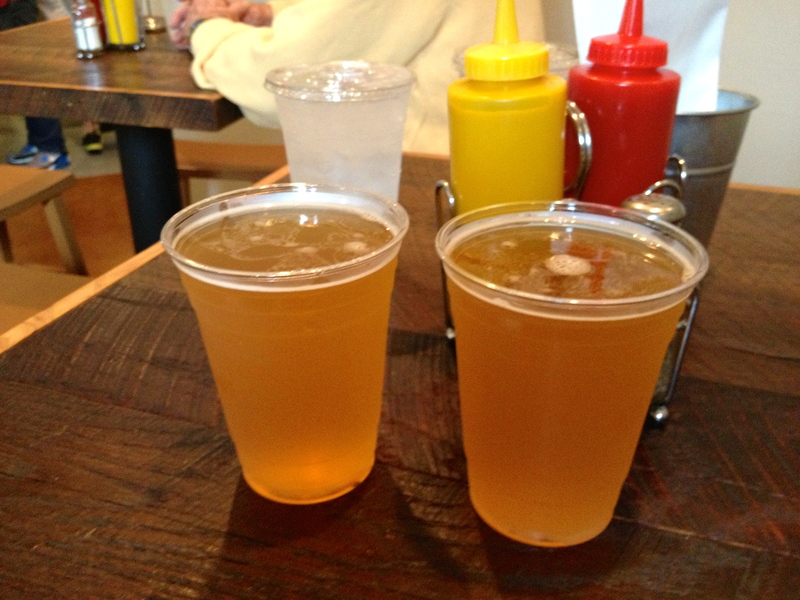 We get the equivalent of two really good beers each for $6 a glass. Maybe we shouldn’t mention this, because if Moxie reads this review, they will either raise the price or cut back on the beer size. Date Night likes to sample as much as we can put in our small stomachs and we decide to try a bunch of different things on the menu. Burgers, dawgs and salads are what you get here, and the nice thing is that Moxie is owned by a local family who works there as well. 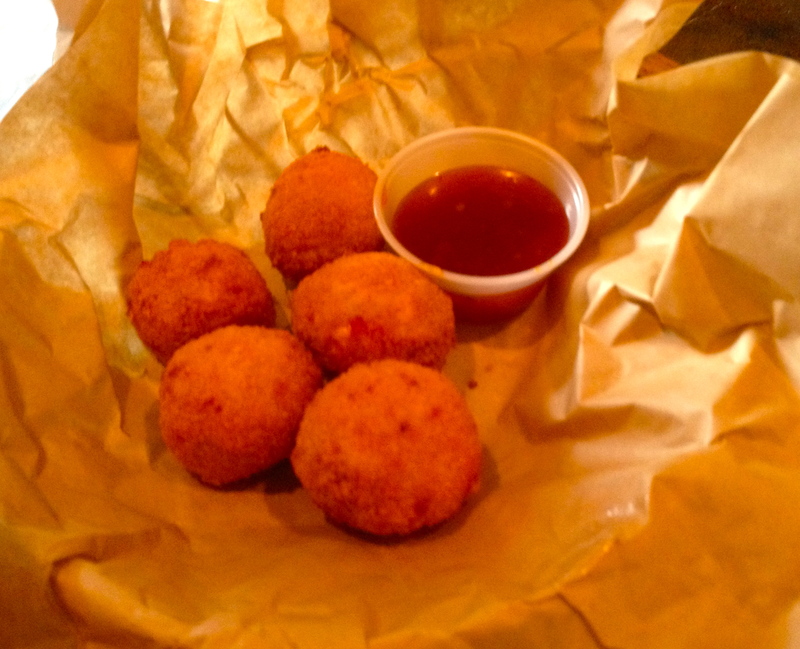 We start off with some fried pimiento cheese bites. Crunchy on the outside, spicy on the inside. There’s nothing more southern than these bites. The cheese inside has a kick, so don’t take too big a bite. You know you want some of these! We get two different kinds of burgers, along with a side of sweet potato fries. First up is “The Gobbler”. 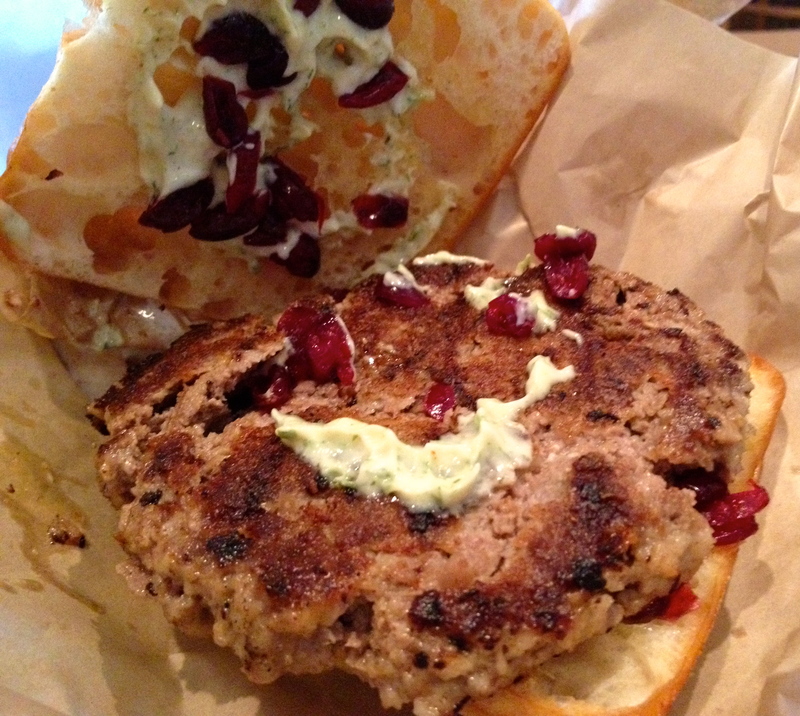 We “gobble up” this turkey burger with dried cranberries and mayo on a ciabatta bun. It’s really good. We also try the signature burger, “The Moxie”. We have another winner on our hands. 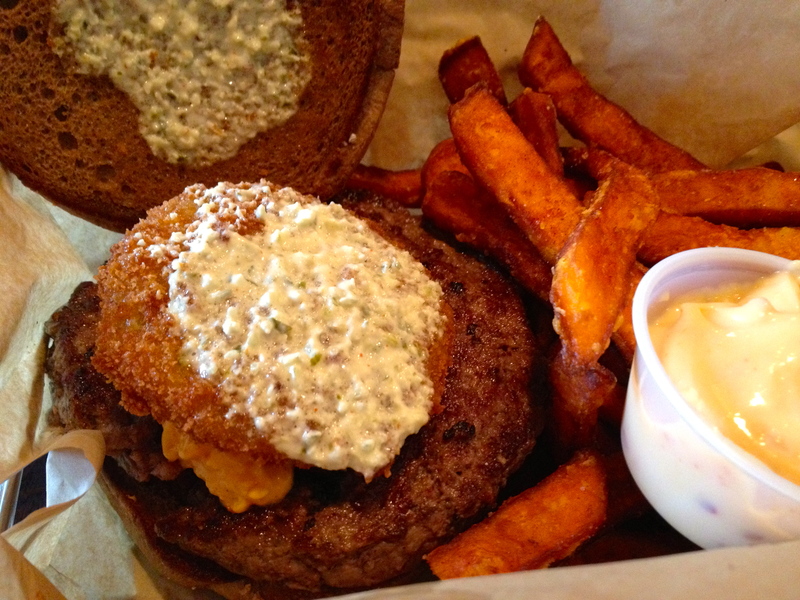 This is an angus burger with bacon, fried green tomato, pimiento cheese (there it is again) and the special Moxie sauce. This is quite the meal and it does stand up to the best burgers in town. The sweet potato fries are good, and you can also get regular fries or zucchini fries. I tried to get them to give us a combo of all three, but that’s not on the menu and they wouldn’t do it. We suggest they put a fries combo on the menu and charge 50 cents more for it. I bet they would sell a bunch of those. The meal for the two of us was under $35, so you can get filled up pretty inexpensively at Moxie. Mags was right–these are really good burgers. 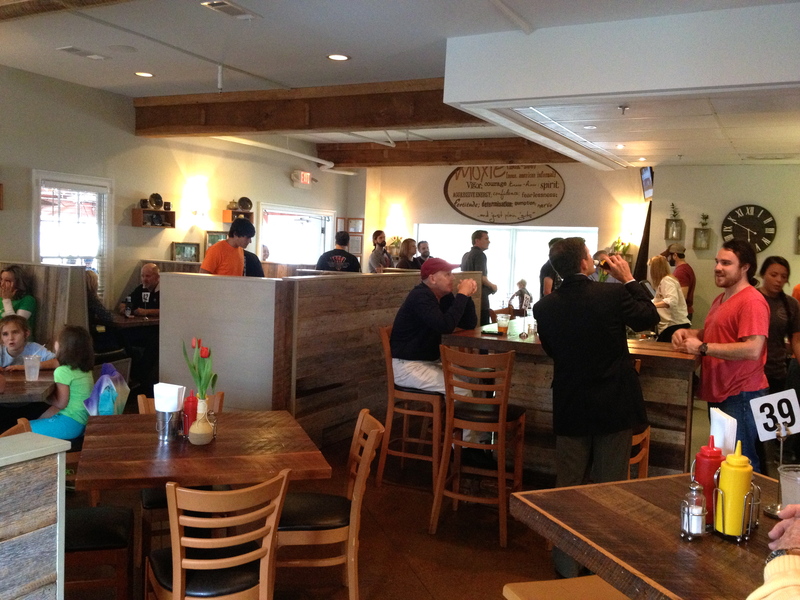 Judging by the crowds, East Cobb thinks they are good burgers too. And with these beer prices, we’ll be back soon for a drink. You can get good popsicles from the King of Pops at Moxie for dessert, but we are too full. 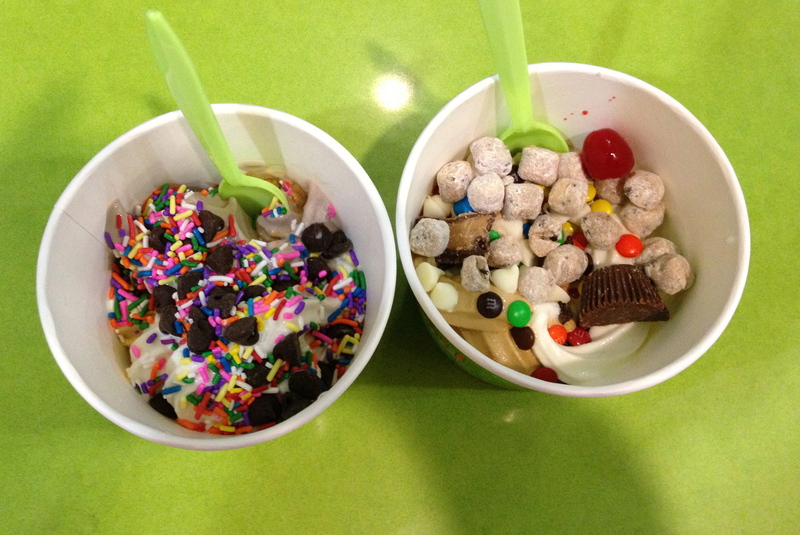 We run some errands after dinner and reward ourselves with a couple of self-serve frozen yogurts at Yogli Mogli. It’s a fun end to another fabulous Date Night.